one of our bedrooms upstairs. This is the room where Spencer stays when he comes home. just right for him too. At the time that I first showed you the room, I was waiting on the perfect art work. And it arrived last week. but truly it was meant for this spot. Maybe someday he'll bring a wife here. Bet she'd like it too. I love it! I play that song every year when we read a short biography on Louis Armstrong in class. I am always amazed how many students have never heard it. I love the song, words, inspiration. No link as to where you got it? I love that song. The wall art version is perfect there! LOVE the sign!! It looks so great in the room! I danced with my dad to this song at my wedding reception. Love it! I love it!! It's so nice that you keep this room for your guy! Love the sign! It's the perfect fit for above the bed and I'm loving all those pretty pillows too! 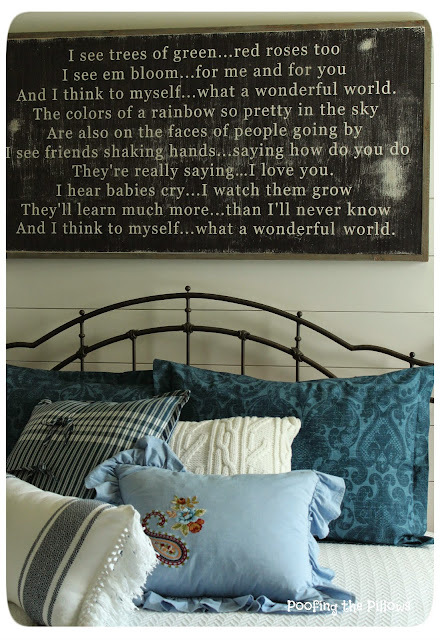 I love wall quotes and that is one of my favorite songs- so I like it! I love it, Stacey! That is one of my all time favorite songs. It always makes me teary but I love hearing it. It makes for a great sign, too. That sign found the perfect spot! When we moved cities and two of our sons were 22, many people assumed we would "downsize." I held out for bedrooms for each of them to come home to. I didn't want them to feel squeezed out of our home just because my husband's job took us to another place. I am so glad I held out and they do have their own places when they come. I love it too! I've always loved the song. My favorite song. My son and I danced to this at his wedding. The marriage didn't last, but it is still my favorite song. I am going over to the site to check it out. Spencer's room is definitely welcoming. Perfect! What a wonderful room! I love it! Looks perfect in there! Oh Stacey, the sign is just beautiful. It looks perfect above your son's bed. Thank you for sharing your source. I just love Tara's work. That is "our" song. Love it! Wow I love this picture- that's a real keeper!. I've got the song running through my head now too! It looks great with the metal bed. I trust he will appreciate it and the positive message it gives! That is a great sign. I love signs that have a nice message like that. That is the perfect piece of art! It also happens to be one of my (26 year old) son's favorite songs too! My son would love it and I hope that your does! Oh I love that song, and love, love the artwork! Perfect indeed! Oh I love that song!! It's perfect Stacey!! Spencer is one lucky young man. 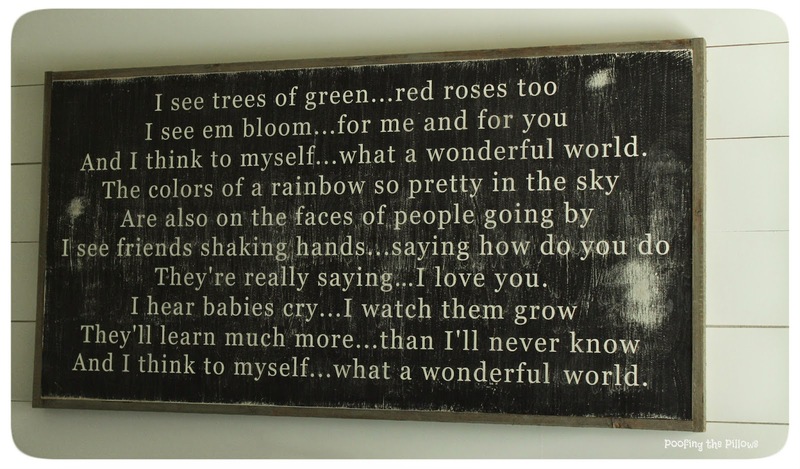 Perfect for Spencer's room. I've always loved that song. It would be perfect for a guest room too. Great blue and white pillows on the bed too. Thanks for stopping by my "new" blog, Stacy. I just love it! I think it would look fantastic in my mudroom. I hope that your son does bring a wife home some day - she is sure to love the sign! Its beautiful! And you're right, it's perfect hanging over the bed. I can relate to finding something I love and hanging it all over the house till I find just the right spot! LOVE your new artwork! Have a great weekend! This sign is incredible! It's one of my favorite songs, and I never thought about it in the form of a sign. Love it! I love, love that song! It really is a wonderful world isn't it? Hi Stacey! I just found you and needless to say, you are pretty awesome! I love your style! 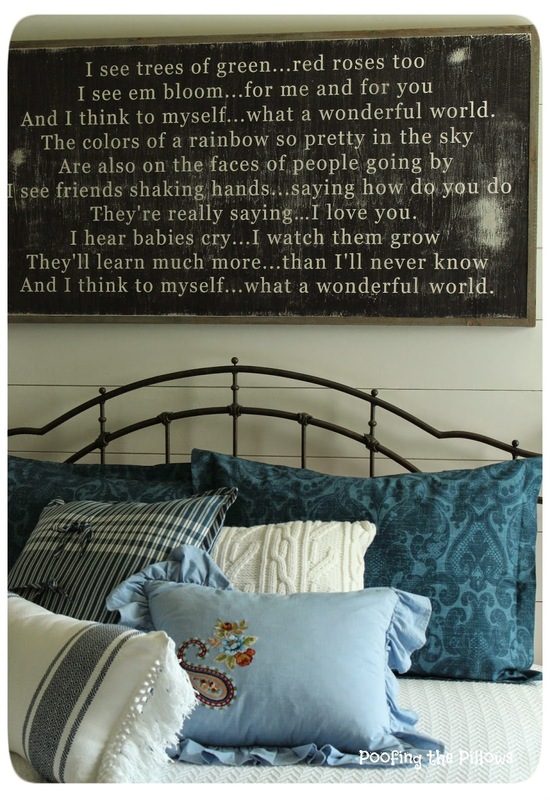 I must know where you purchased that sign, "What a wonderful world", it's my sister's favorite song! I am writing to you today to get your opinion on my baby...not literally one of my kids, but my baby, new invention Blankillow! It's a blanket in a pillow! Two designs one for home, the other for travel. Would you ever use it? The Home Blankillow sits on your sofa as a decretive throw pillow. Then you unzip the seam pull out your snuggling poncho blanket and lay on your pillow which is stuffed with relaxing memory foam! I need your opinion as to whether this is something woman would buy. It was inspired by my sports loving husband that always complained the pretty decretive throw pillows on the sofa are just not comfortable. Any advice would be great! I can even send you a prototype! :) aka@blankillow.com Email me. We launched on Kickstarter and hit our goal within days of launching so you can still grab one (but I will send you one at no cost...shhh don't tell)!